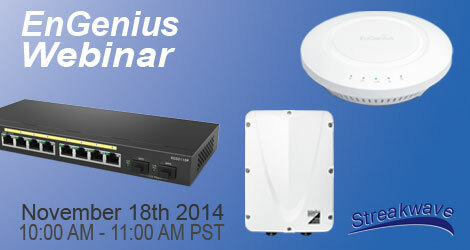 Streakwave Webinars is happy to present: EnGenius Technologies. With a huge range of indoor and outdoor WLAN choices, EnGenius has an option for virtually every projects or deployment, large or small. With products for the unlicensed spectrum, EnGenius provides intuitive and price-attractive solutions and available support for whatever your network communications demands. 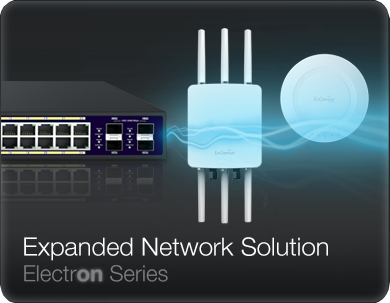 Come learn about the EnGenius Neutron Wireless Management systems, and the Electron Series of flexible network growth and expansion solutions for WLAN. Whether you need a few AP's today or have need for an in-depth network, with an ever expanding deployment of AP's, EnGenius has a feature rich solution available. 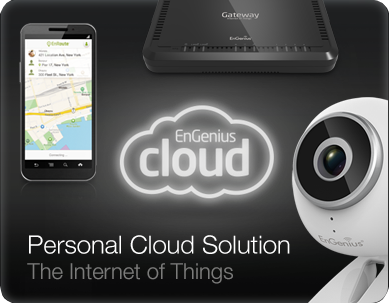 If you need to go from point-to-point outdoors or want to deploy wireless into almost any vertical market (think hospitality, security and surveillance, retail, enterprise, and more), EnGenius has an affordable and supported product choice for you. Come learn about the range of technologies, product choices for applications, and support. See the wide array of means of deployment. This is a free Streakwave Webinar provided as part of a series of ongoing discussions about products, technology choices and trends. Whether you are a VAR/reseller, systems or network integrator, service provider or CTO/IT manager with a project need, this Webinar will provide valuable information and resources. Space is limited. Please register today so you can participate. Get your questions answered during the digital Q' and A' session. Streakwave is a EnGenius distributor.